Rockies right-handed starter German Marquez fell to 1-2 on the season Sunday, taking the loss in a 9-7 rubber game against the Chicago Cubs. The 23-year-old allowed six runs on eight hits, failing to complete the fourth inning. In five starts this year, Marquez has pitched past the fifth inning only once. 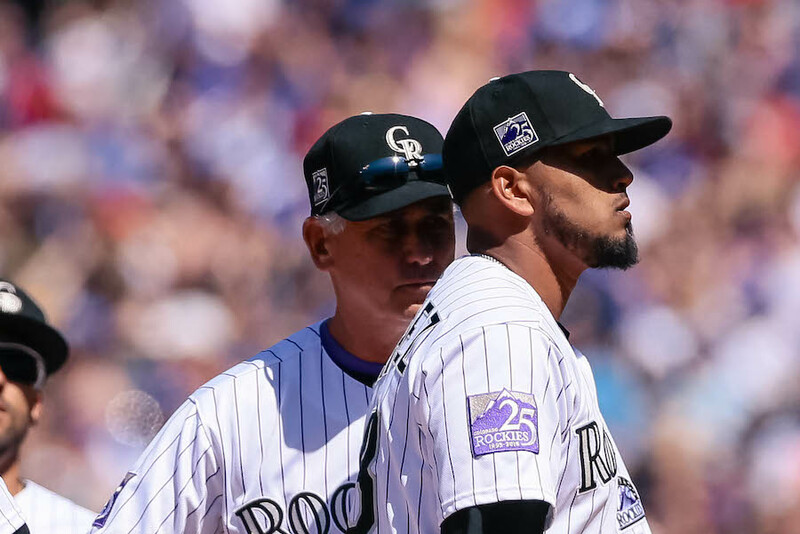 Rockies Manager Bud Black spoke postgame about the struggles last year’s Rockies wins leader has experienced early in 2018. “I don’t think there’s anything he’s doing different,” Black said, specifically addressing Marquez’s difficulty with left-handed hitters Sunday. Marquez on Sunday allowed four consecutive singles against lefties in the first inning, resulting in three runs and setting the tone for a rough day. While Marquez struggled in that inning against lefties, he’s actually been better against them so far in 2018 than against right-handed hitters. His batting average against versus right-handed hitters sits at .306 on the year, and seven of the eight extra-base hits he’s allowed on the season have come against right-handers. His two hit batters have also been right-handed, including Cubs All-Star third baseman Kris Bryant, who had to leave Sunday’s game after being hit with a Marquez fastball in the first inning. Black said postgame that he spoke with Bryant. “He indicated that he was fine,” Black said. “He was sad that he got hit. You know, it wasn’t intentional. [Marquez] was just trying to throw a fastball inside and it got away from him. Against left-handed hitters this year, Marquez has allowed a .224 batting average. Seven of his eight hits allowed Sunday were against lefties; he had allowed just four hits to left-handed hitters in his four prior outings. For his career, Marquez has allowed nearly identical batting averages against left- and right-handed hitters — .279 to .277 respectively. And right-handers, in fact, are slugging significantly better than lefties, .542 versus .414 against Marquez. Marquez carries a 6.14 ERA into his next start, which is penciled in for Saturday at Miami.